In October 2016, I switched to an all-digital note-taking, productivity, and illustration workflow. By “switched” I stopped using paper, pens, and art supplies to capture ideas and create art. Giving up paper and only using my iPad Pro, I began illustrating and taking copious notes. I didn’t worry about running out of paper or carrying around bulky writing and art supply gear. In fact, I gave my wife all my art supplies including the following items. I was all in on creating art and taking notes digitally using the iPad Pro and Apple Pencil. I utilized specific apps for taking notes. One app for handwritten notes, another for typed notes, and a third, and fourth, and … well, you get the idea. I keep a list of all the apps I active use on my Tools page. I’m more productive with note-taking on my iPad than I ever have been with paper. By all accounts, note taking on the iPad Pro with Apple Pencil is wonderful. Yet, an all-digital lifestyle has drawbacks for me. I’m going to be incorporating more paper note taking in my life. The all-digital lifestyle is the future. What happened? In high school (1991-1995) I knew the future of computing would have a computer at the center of everything I do. I never imagined I’d be carrying a laptop, tablet, and smartphone with me every day. That’s three computers. It’s all wonderful and a future I’m happy living in, but I don’t think we’re ready to completely give up paper. At least I’m not. Here are my two main reasons for going back to paper. One of the benefits of note taking on paper is the paper has one purpose—to capture your notes. You can leave a notebook open on a desk or in your lap while you read. When you need to jot down something you read, picking up your pen and writing is effortless. Note taking on my iPad requires several steps. I need to wake my iPad from sleep and unlock it using my fingerprint or typing in a passcode. If my note-taking app isn’t open I have to do the following steps. Select and open the correct digital notebook. Wait for the notebook to load. After all those steps then I can then start writing. Note taking in a paper journal or notebook also allows me to thumb through pages. I can also flip back and forth between two spreads. Those actions aren’t as easy or quick on the iPad. Distractions are a tap away on the iPad. Notifications slide down from the top of the screen with apps vying for my attention. Yes, I can turn off notifications. I can remove distracting apps, and reduce my iPad to nothing more than an input device for taking notes. But that isn’t the best use of the iPad. The biggest distraction for me is the internet. It’s easy to distract myself with YouTube or articles when I face a hard challenge with writing or drawing. While I have these same distractions on my laptop, it’s so much easier to get back to the task at hand. I'm convinced it's easier staying productive with my laptop. Particularly because of decades of experience being productive on desktops and laptops. I can say working on my laptop is a more positive habit I’ve developed over the years. I’m still using my iPad for specific note taking. 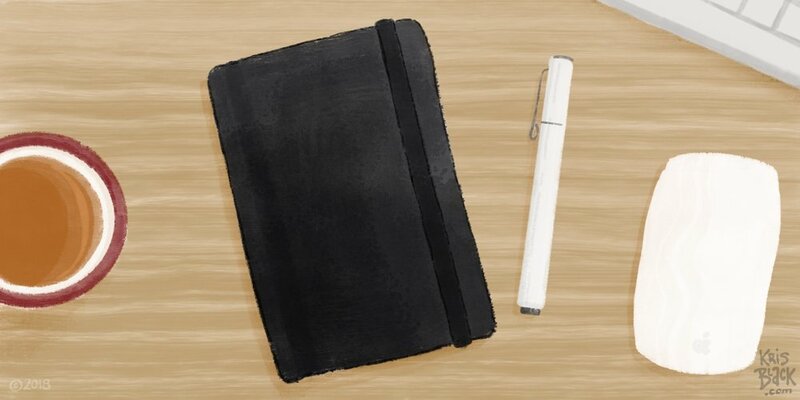 For example, at my day job, I capture tasks on my iPad in our Monday project meetings I need to focus on for the week. For my illustrating and writing, I use the app, OmniFocus, to capture tasks and goals. But I’ve found that each morning I like writing down any specific tasks I need to complete for the day. Writing my daily tasks on paper helps to commit them to memory. It also prevents overcommitting myself for the day. Previously, I wrote about researching children's book creators. While I research I'm taking notes in a paper notebook. I'm doing this mainly to reduce the friction for capturing my ideas, observations, and sketch studies. I’m also drawing and sketching on paper more. I enjoy sitting at the library or coffee shop working on ideas for my stories. It's a pleasure creating in a large sketchpad with some of those fancy art tools I gave to my wife. I’ve come to realize I don’t need to reject paper altogether. I can use my notebook and sketchbook in addition to my iPad.